At a press conference today, “la Caixa” & Visa launched in the Balearic Islands the largest multi-city deployment of contactless payment system in Europe. “Contactless Shopping”, the name given to this project by “la Caixa” and Visa Europe, represents a double milestone: the Balearic Islands will become the first European multi-city area equipped with a contactless payment infrastructure and it will also mean the commercial launch on a large scale in Spain of this new international payment technology. Up until now, these systems have been installed only in specific areas of some cities and, usually, on an experimental basis. In Spain, “la Caixa” and Visa Europe successfully carried out a project in the town of Sitges (Barcelona) in 2010. 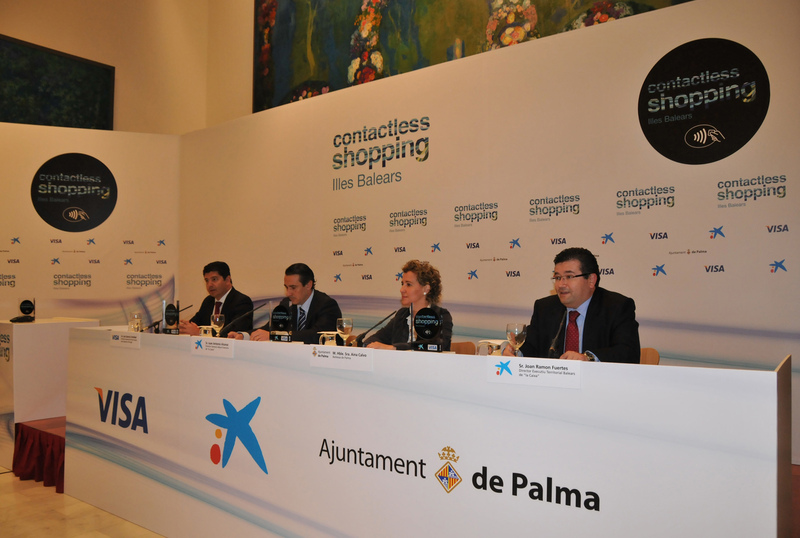 The launch of “Contactless Shopping” in the Balearic Islands will be the largest multi-city deployment of this contactless payment system for the general public across Europe. “la Caixa” will start the installation of contactless POS terminals in shops and restaurants of the Balearic Islands which are clients of “la Caixa”. This process will include 5.000 merchants. A few weeks later, in May, “la Caixa” expects to send contactless payment cards to over 130k Visa cardholders, clients of “la Caixa” in the Balearic Islands, who will receive them in their homes without any additional cost. “la Caixa” expects that aprox. 75% of these cards will be distributed in the island of Mallorca, while the remaining 25% will be divided amongst Menorca, Ibiza and Formentera. As seem elsewhere, the transaction value is set to 20 Euro or less. When making purchases of over 20 Euro the client will have to insert his PIN in order to validate the transaction. “la Caixa” guarantees the proper use of this contactless payment system with CaixaProtect, a system that protects cardholders of this bank in case there is fraudulent use of their electronic payment means. On the other hand, contactless technology is also prepared to operate in specially equipped ATMs. “la Caixa” will soon install some of these terminals in different locations of the Balearic Islands. Contactless cards will also be integrating other added value services for cardholders. For example, in the Balearic Islands, “la Caixa” has signed an agreement with the Metropolitan Transport Company (EMT) of Palma de Mallorca to integrate transport tickets in “la Caixa” Visa cards. This way, Visa contactless cards issued by this bank could be used as a transportation card in the EMT urban buses which have a special reading terminal installed. These cards can also be recharged at the usual selling points. The infrastructure of contactless POS terminals in merchants and the public transport network is designed to accept all possible contactless payment devices that may be launched in the near future: cards, mobile phones, other technological devices, etc. “la Caixa” launched this project with cards because they state that cards are the most common payment device for users and the best suited for a large scale distribution, but the system will be universally valid. It won´t be necessary to install any additional technology when the new mobile phones that allow contactless payments are launched in the market. Any European customer who has a Visa contactless card (also known as Visa payWave) issued by any international bank, would be able to use his card in the Balearic Islands if he wishes to. At the same time, Visa contactless cardholders of “la Caixa” would also be able to use their cards in other places of the world where merchants accept contactless payments.